Solid Copper. Solid Penetration and Expansion. SOLID DEFENSE XTM (SDX). ASYM SDX is loaded in best quality, USA made brass. It is nickel plated for corrosion resistance in a defensive/tactical load. The very finest propellant for the application is used. Extensive testing of every available suitable powder led us to determine the optimal propellant for this premium defensive load. It allows us to deliver extreme consistency, low flash and the best performance, even in short barrel pistols. ASYM SDXTM is, designed for functional reliability and controllability in all weapon systems. It is loaded to a pressure level that delivers outstanding bullet performance, yet does not overly stress the weapon or shooter. 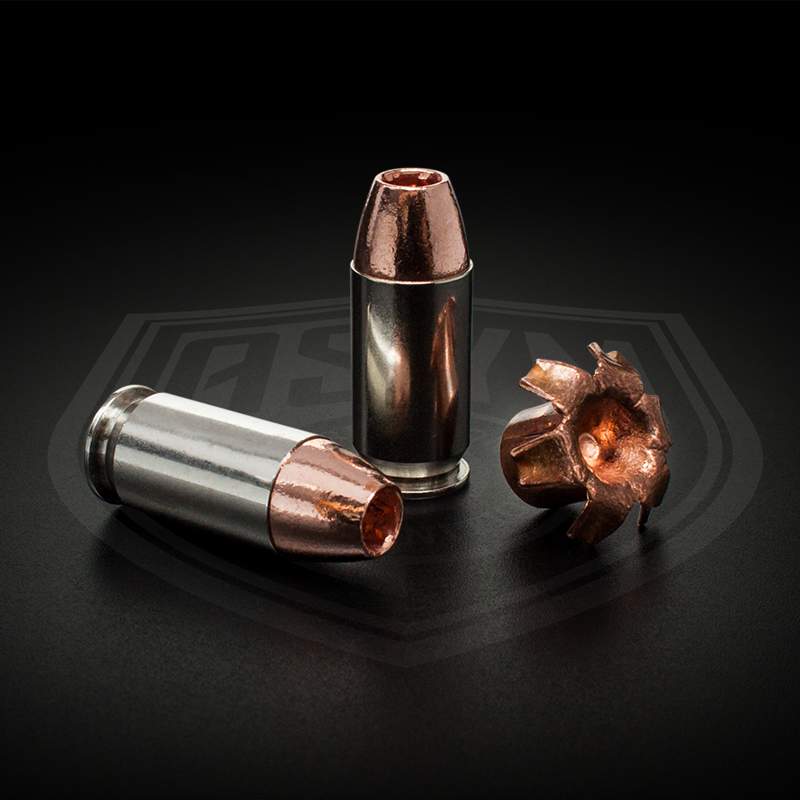 Recoil is even less than standard 45 ball loads. Note: Based on our years of full time precision gunbuilding, we generally feel +P loads in 45 ACP are contraindicated (though they may make good sense in other calibers), especially in “stock” pistols on the 1911 platform. We generally prefer to keep 45 loads at standard pressure. However, due to the unique, long bearing surface of the Barnes solid copper bullet, pressures run higher at a given velocity compared to traditional lead core bullets. Our load just crosses into +P territory. The bottom line is, do not let the +P rating dissuade you, this is a very reliable, controllable, low flash, and moderate blast load. Performance is outstanding in both full size and compact firearms. In pistols containing the proper recoil spring to handle normal, full power ammunition, there is no need to respring the pistol with this load. We only use the best MADE IN USA primers for reliable ignition.